Every so often, I’ll be looking online for one thing when something else grabs my attention. While researching topics that ranged from the federal stimulus program to food banks to the Census, I came across www.intheirboots.com. I defy anyone to watch the videos on this website without feeling pangs of emotion. They are heartfelt, touching, poignant, wrenching, sad and joyous. For many (most?) 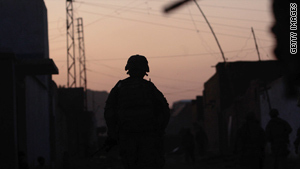 Americans, the wars in Iraq and Afghanistan can be out-of-sight, out-of-mind. Unless you have a relative or friend in harm’s way, it’s easy not to think about those conflicts. The pace U.S. casualties in Iraq has slowed (now at 4,374, with another 31,616 wounded, per www.icasualties.org while the toll in Afghanistan accelerates (now at 972, with 9,496 wounded). The episodes posted online are a reminder of the toll war takes on the men and women who fight and their families. These are first-person “in their own words” pieces, all the stronger without the voice of a narrator. These are the stories of troops who have come home, some with physical and mental wounds that need attention, others needing to restart their lives in the civilian world. These are the stories of wives, husbands, partners, parents and children on the homefront. These are people doing their best to cope with challenges that most of us cannot imagine or understand. “In Their Boots” lets you into the lives of families preparing for a deployment or a homecoming and of children whose mothers are deployed. Others focus on the challenges faced by veterans from Iraq and Afghanistan in dealing with a Veterans Administration that itself is challenged by the burgeoning needs of a swelling veteran population. An episode titled “We Regret To Inform” introduces the viewer to Taryn Davis, who was 21 when her husband was killed in Iraq. Feeling alone in her new world as a war widow, Davis traveled the county and found other women similarly trying to steady themselves. The result was creation of the American Widow Project . “A Good Cause” features three teenage girls from an affluent Washington, D.C., suburb who volunteer to serve the wounded at Walter Reed Army Medical Center and defy expectations by coming every Saturday for two years. A helpful feature of the website is that for each of the videos there are links to resources the troops and their families can use. “In Their Boots” is a production of the Brave New Foundation, funded by the Iraq Afghanistan Deployment Impact Fund of the California Community Foundation. The Brave New Foundation probably would be classified as having a “liberal” or “progressive” orientation in American politics, but these videos are testimony, not advocacy. Everyone, regardless of political leanings, should want to hear what these troops and families have to say. As an aggressive war reporter over a decade ago, it comes into my mind that we can still do without war. I have witnessed umpteen numbers of fellow human beings dying and struggling in pangs of distress due to war/civil conflicts. Now when i think about it I strongly believe that we could have avoided most of these conflicts by strong diplomatic relations/interventions. Many of do understand due to Vietnam. Just lost a brother who served 2 terms in Vietnam, 3 awards, but the mental wounds were never healed. Almost 15 years ago, after the many battles with the VA for assistance, they finally recognized his exposure to agent orange. He died this month. When this war started and Bush had in place an Iraq study commission, I blogged asking "what are the plans for our soldiers upon return". There were none, just like Vietnam. Thank you so much for eveything you've done.You guys are heros due to the tragic in Haiti.That's my country and would hope nothing but well and the best to happen for the future of Haiti.I would like to congratulate the staff of CNN a speacial hanks to Dr.sSonjay and Larry King alnog with Anderson Cooper.Anderson your such a wonderful reporter and has done so much as well as send up dated info CNN.Thank you all that has done so much including Red Cross along with many others.May God bless.